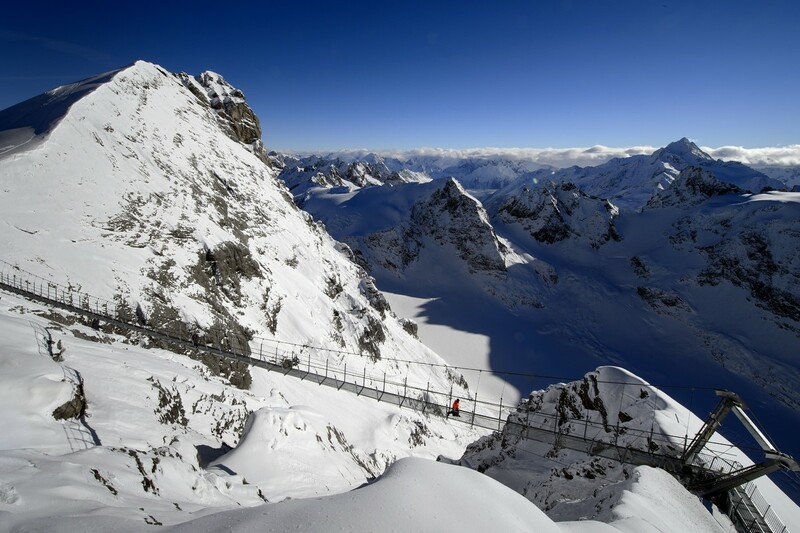 IN his continuing search for the more weird, wacky and wondrous in the world of travel, David Ellis says a must-do for those with steely nerves is to take a walk on Switzerland's new Mount Titlis Cliff Walk – billed as Europe's highest suspension bridge and most-certainly one of the world's scariest. Stretching almost 100m over a vast drop between two points of the Swiss Alps and at 3000m above sea level, the bridge offers views across the Alps, and on a clear day into Italy as well. With a steel-mesh deck just 90cm wide and reinforced wire-mesh sides 2m high to prevent any possibility of visitors falling off, the Cliff Walk took five months to build at a cost of AU$1.53m. And while it sways as visitors walk across it at any time, it can truly rock 'n roll when swept by 200kmh gales, making it as a spokeswoman said, "the highest-adrenaline new adventure in Switzerland. "But as well as winter gales it's strong enough to carry up to 500 tonnes of snow and ice – something that's highly unlikely as it will be regularly 'groomed' during the winter months."